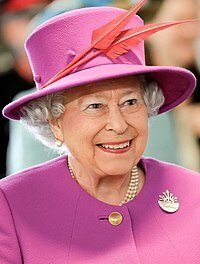 Queen of the United Kingdom of Great Britain and Northern Ireland, Canada, Australia, New Zealand, Jamaica, Barbados, The Bahamas, Grenada, Papua New Guinea, the Solomon Islands, Tuvalu, Saint Lucia, Saint Vincent and the Grenadines, Antigua and Barbuda, Belize, and Saint Kitts and Nevis. Princesses on the footplate during the 1947 Royal Visit to South Africa. Everybody loves a steam whistle! Main gallery: Coronation of Queen Elizabeth II.